^ Statistiche demografiche ISTAT. Demo.istat.it. [23 April 2010]. ^ Eurostat – Tables, Graphs and Maps Interface (TGM) table. Epp.eurostat.ec.europa.eu. 11 March 2011 [2 June 2011]. ^ . qds.it (2011-02-24). Retrieved on 2012-12-18. 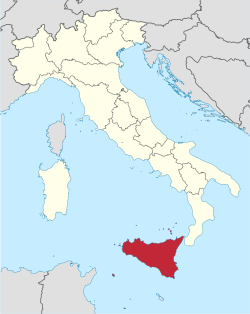 ^ Sicily. KeyItaly.com. 20 November 2007. ^ Ninni Radicini. The Trinacria - History and Mythology. ^ Britannica – Travel & Geography – Sicily Italian Sicilia – retrieved 11 May 2010. ^ Darwin Porter, Danforth Prince. Frommer's Sicily. Frommer's. 2009: 268. ISBN 978-0-470-39899-9. ^ Agenzia Regionale per i Rifiuti e le Acque. Osservatorio delle Acque. [14 October 2010].